The big house did prove a Palace Beautiful, though it took some time for all to get in, and Beth found it very hard to pass the lions. Old Mr. Laurence was the biggest one, but after he had called, said something funny or kind to each one of the girls, and talked over old times with their mother, nobody felt much afraid of him, except timid Beth. The other lion was the fact that they were poor and Laurie rich, for this made them shy of accepting favors which they could not return. But, after a while, they found that he considered them the benefactors, and could not do enough to show how grateful he was for Mrs. March's motherly welcome, their cheerful society, and the comfort he took in that humble home of theirs. So they soon forgot their pride and interchanged kindnesses without stopping to think which was the greater. All sorts of pleasant things happened about that time, for the new friendship flourished like grass in spring. Every one liked Laurie, and he privately informed his tutor that "the Marches were regularly splendid girls." With the delightful enthusiasm of youth, they took the solitary boy into their midst and made much of him, and he found something very charming in the innocent companionship of these simple-hearted girls. Never having known mother or sisters, he was quick to feel the influences they brought about him, and their busy, lively ways made him ashamed of the indolent life he led. He was tired of books, and found people so interesting now that Mr. Brooke was obliged to make very unsatisfactory reports, for Laurie was always playing truant and running over to the Marches'. "Never mind, let him take a holiday, and make it up afterward," said the old gentleman. "The good lady next door says he is studying too hard and needs young society, amusement, and exercise. I suspect she is right, and that I've been coddling the fellow as if I'd been his grandmother. Let him do what he likes, as long as he is happy. He can't get into mischief in that little nunnery over there, and Mrs. March is doing more for him than we can." What good times they had, to be sure. Such plays and tableaux, such sleigh rides and skating frolics, such pleasant evenings in the old parlor, and now and then such gay little parties at the great house. Meg could walk in the conservatory whenever she liked and revel in bouquets, Jo browsed over the new library voraciously, and convulsed the old gentleman with her criticisms, Amy copied pictures and enjoyed beauty to her heart's content, and Laurie played `lord of the manor' in the most delightful style. "The boy neglects his music now, and I'm glad of it, for he was getting too fond of it. But the piano suffers for want of use. Wouldn't some of your girls like to run over, and practice on it now and then, just to keep it in tune, you know, ma`am?" "They needn't see or speak to anyone, but run in at any time. For I'm shut up in my study at the other end of the house, Laurie is out a great deal, and the servants are never near the drawing room after nine o'clock." "Oh sir, they do care, very very much!" "Are you the musical girl?" he asked, without any startling "Hey!" as he looked down at her very kindly. "I'm Beth. I love it dearly, and I'll come, if you are quite sure nobody will hear me, and be disturbed," she added, fearing to be rude, and trembling at her own boldness as she spoke. "Not a soul, my dear. The house is empty half the day, so come and drum away as much as you like, and I shall be obliged to you." "How kind you are, sir!" "I had a little girl once, with eyes like these. God bless you, my dear! Good day. madam." And away he went, in a great hurry. Beth had a rapture with her mother, and then rushed up to impart the glorious news to her family of invalids, as the girls were not home. How blithely she sang that evening, and how they all laughed at her because she woke Amy in the night by playing the piano on her face in her sleep. Next day, having seen both the old and young gentleman out of the house, Beth, after two or three retreats, fairly got in at the side door, and made her way as noiselessly as any mouse to the drawing room where her idol stood. Quite by accident, of course, some pretty, easy music lay on the piano, and with trembling fingers and frequent stops to listen and look about, Beth at last touched the great instrument, and straightway forgot her fear, herself, and everything else but the unspeakable delight which the music gave her, for it was like the voice of a beloved friend. She stayed till Hannah came to take her home to dinner, but she had no appetite, and could only sit and smile upon everyone in a general state of beatitude. After that, the little brown hood slipped through the hedge nearly every day, and the great drawing room was haunted by a tuneful spirit that came and went unseen. She never knew that Mr. Laurence opened his study door to hear the old-fashioned airs he liked. She never saw Laurie mount guard in the hall to warn the servants away. She never suspected that the exercise books and new songs which she found in the rack were put there for her especial benefit, and when he talked to her about music at home, she only thought how kind he was to tell things that helped her so much. So she enjoyed herself heartily, and found, what isn't always the case, that her granted wish was all she had hoped. Perhaps it was because she was so grateful for this blessing that a greater was given her. At any rate she deserved both. "Mother, I'm going to work Mr. Laurence a pair of slippers. He is so kind to me, I must thank him, and I don't know any other way. Can I do it?" asked Beth, a few weeks after that eventful call of his. "Yes, dear. It will please him very much, and be a nice way of thanking him. The girls will help you about them, and I will pay for the making up," replied Mrs. March, who took peculiar pleasure in granting Beth's requests because she so seldom asked anything for herself. After many serious discussions with Meg and Jo, the pattern was chosen, the materials bought, and the slippers begun. A cluster of grave yet cheerful pansies on a deeper purple ground was pronounced very appropriate and pretty, and beth worked away early and late, with occasional lifts over hard parts. She was a nimble little needlewoman, and they were finished before anyone got tired of them. Then she wrote a short, simple note, and with Laurie's help, got them smuggled onto the study table one morning before the old gentleman was up. "Here's a letter from the old gentleman! Come quick, and read it!" "Oh, Beth, he's sent you..." began Amy, gesticulating with unseemly energy, but she got no further, for Jo quenched her by slamming down the window. Beth hurried on in a flutter of suspense. At the door her sisters seized and bore her to the parlor in a triumphal procession, all pointing and all saying at once, "Look there! Look there!" Beth did look, and turned pale with delight and surprise, for there stood a little cabinet piano, with a letter lying on the glossy lid, directed like a sign board to "Miss Elizabeth March." "For me?" gasped Beth, holding onto Jo and feeling as if she should tumble down, it was such an overwhelming thing altogether. "Yes, all for you, my precious! Isn't it splendid of him? Don't you think he's the dearest old man in the world? Here's the key in the letter. We didn't open it, but we are dying to know what he says," cried Jo, hugging her sister and offering the note. "You read it! I can't, I feel so queer! Oh, it is too lovely!" and Beth hid her face in Jo's apron, quite upset by her present. "Miss March: "Dear Madam--" "How nice it sounds! I wish someone would write to me so!" said Amy, who thought the old-fashioned address very elegant. "There, Beth, that's an honor to be proud of, I'm sure! Laurie told me how fond Mr.Laurence used to be of the child who died, and how he kept all her little things carefully. Just think, he's given you her piano. That comes of having big blue eyes and loving music," said Jo, trying to soothe Beth, who trembled and looked more excited than she had ever been before. "See the cunning brackets to hold candles, and the nice green sild, puckered up, with a gold rose in the middle, and the pretty rack and stool, all complete," added Meg, opening the instrument and displaying its beauties. "`Your humble servant, James Laurence'. Only think of his writing that to you. I'll tell the girls. They'll think it's splendid," said Amy, much impressed by the note. "Try it, honey. 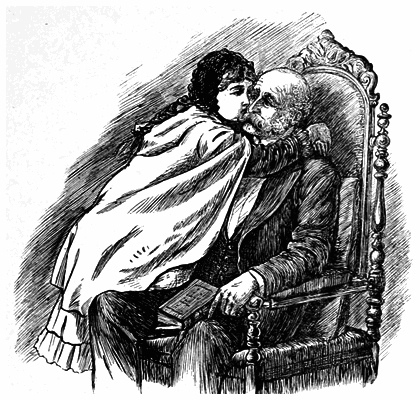 Let's hear the sound of the baby pianny," said Hannah, who always took a share in the family joys and sorrows. So Beth tried it, and everyone pronounced it the most remarkable piano ever heard. It had evidently been newly tuned and put in apple- pie order, but, perfect as it was, I think the real charm lay in the happiest of all happy faces which leaned over it, as Beth lovingly touched the beautiful black and white keys and pressed the bright pedals. "You'll have to go and thank him," said Jo, by way of a joke, for the idea of the child's really going never entered her head. "Yes, I mean to. I guess I'll go no, before I get frightened thinking about it." And, to the utter amazement of the assembled family, Beth walked deliberately down the garden, through the hedge, and in at the Laurences' door. "Well, I wish I may die if it ain't the queerest thing I ever see! The pianny has turned her head! She'd never have gone in her right mind," cried Hannah, staring after her, while the girls were rendered quite speechless by the miracle. They would have been still more amazed if they had seen what Beth did afterward. If you will believe me, she went and knocked at the study door before she gave herself time to think, and when a gruff voice called out, "come in!" she did go in, right up to Mr. Laurence, who looked quite taken aback, and held out her hand, saying, with only a small quaver in her voice, "I came to thank you, sir, for..." But she didn't finish, for he looked so friendly that she forgot her speech and, only remembering that he had lost the little girl he loved, she put both arms round his neck and kissed him. If the roof of the house had suddenly flown off, the old gentleman wouldn't have been more astonished. But he liked it. Oh, dear, yes, he liked it amazingly! And was so touched and pleased by that confiding little kiss that all his crustiness vanished, and he just set her on his knee, and laid his wrinkled cheek against her rosy one, feeling as if he had got his own little grand daughter back again. Beth ceased to fear him from that moment, and sat there talking to him as cozily as if she had known him all her life, for love casts out fear, and gratitude can conquer pride. When she went home, he walked with her to her own gate, shook hands cordially, and touched his hat as he marched back again, looking very stately and erect, like a handsome, soldierly old gentleman, as he was. When the girls saw that performance, Jo began to dance a jig, by way of expressing her satisfaction, Amy nearly fell out of the window in her surprise, and Meg exclaimed, with up-lifted hands, "Well, I do believe the world is coming to an end.